· MQTT Version 3.1.1. Edited by Andrew Banks and Rahul Gupta. Latest version: http://docs.oasis-open.org/mqtt/mqtt/v3.1.1/mqtt-v3.1.1.html. This document provides guidance for organizations wishing to deploy MQTT in a way consistent with the NIST Framework for Improving Critical Infrastructure cybersecurity. This document was last revised or approved by the OASIS Message Queuing Telemetry Transport (MQTT) TC on the above date. The level of approval is also listed above. Check the “Latest version” location noted above for possible later revisions of this document. Technical Committee members should send comments on this document to the Technical Committee’s email list. Others should send comments to the Technical Committee by using the “Send A Comment” button on the Technical Committee’s web page at https://www.oasis-open.org/committees/mqtt/. MQTT and the NIST Cybersecurity Framework Version 1.0. Edited by Geoff Brown and Louis-Philippe Lamoureux. 10 April 2014. OASIS Committee Note Draft 01 / Public Review Draft 01. http://docs.oasis-open.org/mqtt/mqtt-nist-cybersecurity/v1.0/cnprd01/mqtt-nist-cybersecurity-v1.0-cnprd01.html. Latest version: http://docs.oasis-open.org/mqtt/mqtt-nist-cybersecurity/v1.0/mqtt-nist-cybersecurity-v1.0.html. The purpose of this supplemental publication is to introduce implementors and senior executives to the NIST Framework for Improving Critical Infrastructure Cybersecurity (herein referred as the NIST Cybersecurity Framework) and its relationship with the MQTT security recommendations. The NIST Cybersecurity Framework provides a common language and mechanism for organizations to: 1) describe current cybersecurity posture; 2) describe their target state for cybersecurity; 3) identify and prioritize opportunities for improvement within the context of risk management; 4) assess progress toward the target state; 5) foster communications among internal and external stakeholders. The NIST Cybersecurity Framework complements, and does not replace, an organization’s existing business or cybersecurity risk management process and cybersecurity program. Rather, the organization can use its current processes and leverage the NIST Cybersecurity Framework to identify opportunities to improve an organization’s cybersecurity risk management. It also provides a consensus description of what's needed for a comprehensive cybersecurity program. The NIST Cybersecurity Framework is a risk-based approach to managing cybersecurity risk, and is composed of three parts: the Framework Core, the Framework Implementation Tiers, and the Framework Profiles. Each Framework component reinforces the connection between business drivers and cybersecurity activities. The components are described below. The Framework Core is a set of cybersecurity activities, desired outcomes, and applicable references that are common across critical infrastructure sectors. The Core presents industry standards, guidelines, and practices in a manner that allows for communication of cybersecurity activities and outcomes across the organization from the executive level to the implementation and operations level. The Framework Core consists of five concurrent and continuous functions: Identify, Protect, Detect, Respond, Recover. When considered together, these Functions provide a high-level, strategic view of the lifecycle of an organization’s management of cybersecurity risk. The Framework Core then identifies underlying key Categories and Subcategories for each Function, and matches them with example Informative references such as existing standards, guidelines, and practices for each Subcategory. Framework Implementation Tiers (“Tiers”) provide context on how an organization views cybersecurity risk and the processes in place to manage that risk. Tiers describe the degree to which their cybersecurity risk management practices exhibit the characteristics defined in the Framework (e.g., risk and threat aware, repeatable, and adaptive). 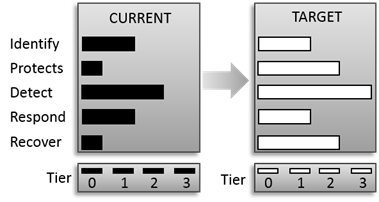 The Tiers characterize an organization’s practices over a range, from Partial (Tier 1) to Adaptive (Tier 4). These Tiers reflect a progression from informal, reactive responses to approaches that are agile and risk-informed. During the Tier selection process, an organization should consider its current risk management practices, threat environment, legal and regulatory requirements, business/mission objectives, and organizational constraints. A Framework Profile (“Profile”) represents the outcomes based on business needs that an organization has selected from the Framework Categories and Subcategories. The Profile can be characterized as the alignment of standards, guidelines, and practices to the Framework Core in a particular implementation scenario. Profiles can be used to identify opportunities for improving cybersecurity posture by comparing a Current Profile (the “as is” state) with a Target Profile (the “to be” state). To develop a Profile, an organization can review all of the Categories and Subcategories and, based on business drivers and a risk assessment, determine which are most important; they can add Categories and Subcategories as needed to address the organization’s risks. The Current Profile can then be used to support prioritization and measurement of progress toward the Target Profile, while factoring in other business needs including cost-effectiveness and innovation. Profiles can be used to conduct self-assessments and communicate within an organization or between organizations. In the context of the MQTT protocol, each NIST Cybersecurity component has been reduced to solely reflect security considerations of the protocol and are renamed accordingly: MQTT cybersecurity Framework Core, MQTT cybersecurity Framework Implementation Tiers, and MQTT cybersecurity Framework Profile. The MQTT cybersecurity Framework Core consists of the same five Functions (Identify, Protect, Detect, Respond, Recover) which can provide a high-level, strategic view of an organization’s management of MQTT related cybersecurity risk. The MQTT cybersecurity Framework Core then identifies underlying key Categories and Subcategories for each of these Functions described in Section 2. Because the MQTT cybersecurity Framework is smaller in scope it is unnecessary to provide references for every Category and Subcategory. A non-exhaustive list of informative references is provided in Section 1.2. The MQTT cybersecurity Framework Implementation Tiers demonstrate the implementation of the MQTT cybersecurity Framework Core Functions and Categories and indicate how cybersecurity risk is managed. Organizations should determine the desired Tiers at the Category level, ensuring that the selected levels meet the organizational goals, mitigate cybersecurity risk, and are feasible to implement. External guidance will be helpful, such as information that could be obtained from OASIS Security Assertion Markup Language (SAML), the Federal Information Processing Standards (FIPS), and Payment Card Industry Data Security Standard (PCI DSS). The Tier definitions are described below. The organization has not yet implemented a formal, threat-aware MQTT risk management process to determine a prioritized list of cybersecurity activities. The organization might implement some portions of the Framework on an ad hoc basis due to varied experience or information gained from outside sources. The organization uses a formal, threat-aware MQTT risk management process to develop an MQTT Profile of the Framework. In addition, risk-informed, management approved processes and procedures are defined and implemented. Staff have adequate resources to perform their cybersecurity duties. The organization updates its Profile based on regular application of its MQTT risk management process to respond to a changing cybersecurity landscape. Risk informed policies, processes, and procedures are defined, implemented as intended, and validated. The organization will also have consistent methods in place to provide updates when a risk change occurs. The organization updates its Profile based on predictive indicators derived from previous and anticipated cybersecurity activities. These updates to the Profile enable the organization to adapt to an evolving cybersecurity landscape and address emerging threats. Risk-informed policies, processes, and procedures are part of the organizational culture and are reviewed regularly - including feedback from lessons learned and information shared from other sources - to predict and address potential cybersecurity events. An MQTT cybersecurity Framework Profile enables organizations to establish a roadmap for reducing MQTT related cybersecurity risk that is well-aligned with organization and sector goals, considers legal and regulatory requirements, and reflects risk management priorities. An MQTT cybersecurity Framework Profile can be used to describe both the current state and the desired target state of specific MQTT cybersecurity activities, thus revealing gaps that could be addressed to meet MQTT cybersecurity risk management objectives. The Profile is the selection of the Functions, Categories, and Subcategories that are aligned with the business requirements, risk tolerance, and resources of the organization. The Target Profile should support business requirements and aid in the communication of risk within and between organizations. Identifying the gaps between the Current Profile and the Target Profile allows the creation of a roadmap that organizations could implement to reduce MQTT related cybersecurity risk. Together, the three MQTT Cybersecurity Framework components allow organizations to understand and shape their cybersecurity program. The following sub sections illustrate how this can be done. The organization identifies its business/mission objectives and high-level organizational priorities. With this information, the organization makes strategic decisions regarding cybersecurity implementations and determines the scope of systems and assets that support the selected business line or process. Once the scope of the cybersecurity program has been determined for the business line or process, the organization identifies related systems and assets, regulatory requirements, and their overall risk approach. The organization then identifies threats to, and vulnerabilities of, those systems and assets. The organization develops a Current Profile by indicating which Category and Subcategory outcomes from the Framework Core are currently being achieved. This assessment could be guided by the organization’s overall risk management process or previous risk assessment activities. The organization analyzes the operational environment in order to discern the likelihood of a cybersecurity event and the impact that the event could have on the organization. It is important that organizations seek to incorporate emerging risks and threat and vulnerability data to facilitate a robust understanding of the likelihood and impact of cybersecurity events. The organization creates a Target Profile that focuses on the assessment of the Framework Categories and Subcategories describing the organization’s desired cybersecurity outcomes. Organization may develop their own additional Categories and Subcategories to account for unique organizational risks. The organization also consider influences and requirements of external stakeholders such as sector entities, customers, and business partners when creating a Target Profile. The organization compares the Current Profile and the Target Profile to determine gaps. Next it creates a prioritized action plan to address those gaps that draws upon mission drivers, a “cost benefit” analysis, and understanding of risk to achieve the outcomes in the Target Profile. The organization then determines resources necessary to address the gaps. Using Profiles in this manner enables the organization to make informed decisions about cybersecurity activities, supports risk management, and enables the organization to perform cost-effective, targeted improvements. · Section 2 describes the MQTT cybersecurity Framework Core Functions. · Appendix A is an Example Implementation of the MQTT cybersecurity Framework. This section describes the five MQTT cybersecurity Framework Core Functions and how they can be used to assess an organization’s cybersecurity level where the MQTT protocol is used. The list of components associated with each function presented here is non-exhaustive and provided as a starting point for a cybersecurity Management Framework. Implementors should modify Categories and Subcategories as they see fit such as to tailor the MQTT Cybersecurity Framework functions for their organization. Informative References described in Section 1.2 should also be modified to reflect an organization’s regulatory requirements. 3. establish processes to achieve risk management goals. The purpose of this function is to develop and implement the appropriate MQTT safeguards, prioritized through the organization’s risk management process, to ensure delivery of critical infrastructure services. The purpose of this function is to develop and implement the appropriate activities to identify the occurrence of an MQTT related cybersecurity event. The purpose of this function is to develop and implement the appropriate activities, prioritized through the organization’s risk management process, to take action in response to a detected cybersecurity event. The purpose of this function is to develop and implement the appropriate activities, prioritized through the organization’s risk management process, to restore the appropriate capabilities that were impaired through a cybersecurity event. This section provides a worked example to show how the Framework can be applied to help manage MQTT cybersecurity risk. 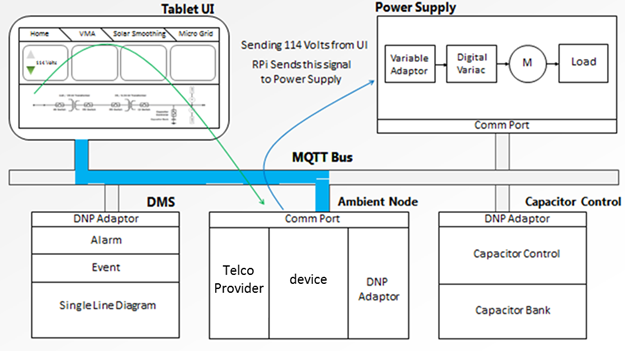 A large energy provider intends to implement an open-source, broker-agnostic, and distributed field message bus architecture based on the MQTT protocol. Protecting the bus architecture is essential because the energy provider is a critical infrastructure. The organization is looking to build a new architecture around an open-source, broker agnostic 'communication node' concept and is running a pilot project to assess feasibility, and integration within its wider message bus. Its primary role is to facilitate interoperability between the various operational technologies deployed (i.e. SCADA, EMS, DMS, OMS, MDM, etc.) and also augment these technologies by using the MQTT protocol for the efficient sharing and processing of data closer to the asset(s) required for the rapid, reliable, and safe execution of operational functions of all priorities on the electric grid. 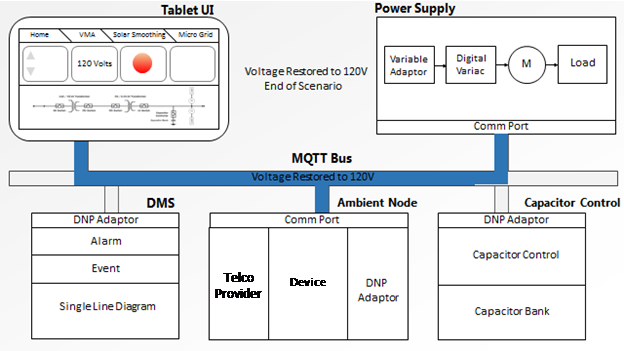 Consequently, using the MQTT protocol will not only improve the simplicity and the integrity of the information exchanges between disparate assets in the field, but also inherently filter a significant amount of unused data overhead and, more importantly, will eliminate the need to backhaul all raw data to a central data center. Fundamentally, these benefits will translate into vast savings in the cost of operating the IT systems and telecommunication networks, but can also achieve further value by enabling deployed control schemes that are not presently feasible without distributed decision-making closer to the electric grid assets. The energy provider is running the following Field Message Bus scenario, based on MQTT. The initial and final state of the system is shown in picture form. The intermediate publish and subscribe steps are described the following paragraph. Initial State: Scenario starts when the Tablet UI publishes low voltage – 114V. A Tablet PC is used to control the voltage of a power supply that feeds input voltage to a smart meter. The scenario starts when the Tablet UI publishes low voltage – 114V. The smart meter sees the low voltage and publishes its voltage status change to the distribution management system (DMS). The DMS subscribes and updates its status. The DMS publishes a control command to the cap bank controller to close the cap bank, thus raising the voltage. The cap bank controller publishes its status change – closed – back to the DMS. The DMS subscribes to the cap bank controller status change; it updates its single-line diagram and publishes a raise voltage volt-120 command to the Power Supply who subscribes and makes the change. The meter publishes its voltage status change – 120V. The DMS publishes an updated single-line diagram to the Tablet UI showing the closed cap bank. This scenario is complete when the Tablet UI subscribes to and displays the updated single-line diagram from the DMS. This simple test scenario reveals the richness, flexibility, and ease of use of publish and subscribe Field Message Bus, MQTT technology. Future plans for the Field Message Bus is to include the necessary security layers: authentication, authorization, encryption, intrusion detection, and quality of trust behavior analytics to the distributed enterprise. e diagram from the DMS. The NIST Cybersecurity Framework document in section 3.2 provides guidance on the steps an organization can take to establish or improve a cybersecurity program. Following the initial steps the energy provider has developed a Framework Core informed by several recommendation publications such as NIST Special publication 800-26 (Security Self-Assessment Guide for Information Technology Systems" for advice on how to manage IT security and ISO 15408 (Evaluation criteria for IT security) to test the security of the bus architecture. The energy provider has also a list of standards it must comply with imposed by the US government. The Framework Core established for the current MQTT bus architecture is defined below. Using this Framework Core the energy provider assesses the current Implementation Tier status (in this case at the Function level), conducts a risk assessment of the current operational environment and creates a Target Profile indicating the desired Implementation Tier status for each Function. The differences between the current and target profiles are analyzed to determine the actions required to bridge the gaps, the results of which are fed into the energy provider's existing cybersecurity program. While the majority of the cybersecurity program is concerned with security governance and risk management, there are three distinct sections where MQTT critically interlocks with other compliance processes. o In order to provide resilience, an effect approach is to segregate the message system control plane from the message delivery system. This enables system management processes to analyze control information from message content. o It is recommended that QoS levels for the system control plane have a higher priority than the normal message delivery channel. This approach ensures that reconfiguration, partitioning or isolation of internal and external communications channels can be applied without hindrance from the message delivery system. o Security within MQTT is predominantly TLS. However for the energy provider, there are a number of small form factor/constrained devices such as SCADA control systems that leverage existing light-weight cryptography as well as the prolific AES standard. Thus the energy provider would use TLS, however higher level security process would use PKI management to interoperate with existing Cryptography suites. - While MQTT is a backbone messaging system, the segregation of the system control plane (with QoS settings) and the message delivery system allows third party monitoring systems easy access to information flow. - The use, placement and location of persistent and non-persistent MQTT queues has a huge bearing on recovery. For the Energy power provider, MQTT uses non-persistent queues on edge devices and persistent queues for all server side brokers. This approach allows the central services to recover much quicker as the edge devices are always synchronized with the server side MQTT persistent queues. Incorporated latest JIRAs (200, 206, and 207).